I know, it has been a long time between drinks, life is just too busy. We covered it with some patterned paper then applied some texture paste through a template. 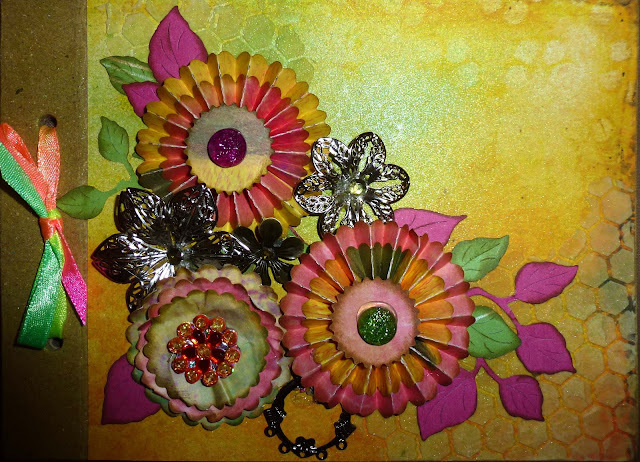 A spray with a couple of Glimmer Mists and some hand made flowers, metal embellishments left over from Finn's class and some die cut leaves. Looks very nice and Mum is very happy with it. I did not get much of mine done. Covered the book with patterned paper, and completed the texture paste and Glimmer Mist. Have been messing around with it a bit this afternoon but have not finalised anything as yet. Will share it when it is finished. 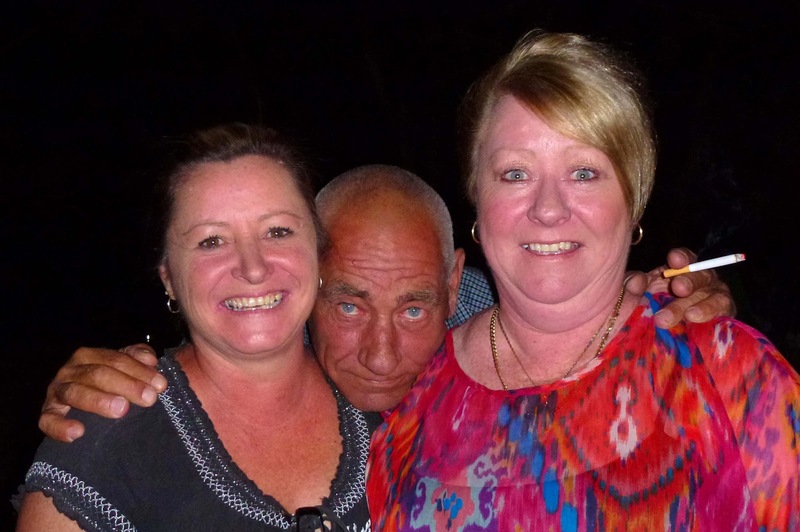 Last saturday night we went to Stockport (between Gawler and Tarlee) for my nephews 30th birthday party. The weather was perfect and we had a great night. All of my sisters were there but unfortunately my brother could not make it, he had and interview with a panel so my niece can hopefully go to America as an exchange student. These photos are of my sisters at the party, with the addition of a friend. Mum went home yesterday and things are back to normal with me. I am thinking... about what I have to do tomorrow. I will spend most of the day running around catching up on the various messy shopping I need to get out of the way. I am thankful for... Mum seemed to enjoy herself while she was here. I did not think she would handle the 10 day stay very well as she generally does not like to be away from home for too long. I am wearing... a skirt, t shirt and ugg boots!!!!! I am currently reading... nothing. I have become addicted to Candy Crush on my iPad and seem to spend any free time I get trying to reach the next level, or waiting for some more lives. on my mind ... Ray went to the doctor today to get results of his blood test and has high cholesterol. This will require a change in his eating habits so I will have to adjust my shopping to suit. around the house ... everything is normal. A good way to be. one of my favourite things ... seeing family members I have not seen for a while. 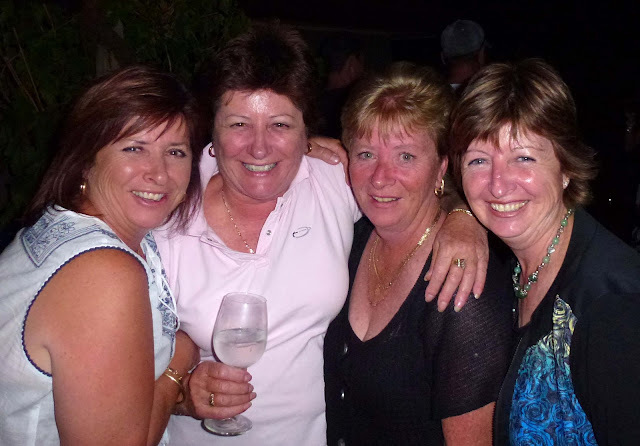 a few plans for the rest of the week ... Yogalaties on Thursday, hairdressers on Thursday, dinner with Ray, Cindy and Charli on Friday, celebrating Ray's 60th birthday on saturday night and Birdwood Rock and Roll Rendezvous on Sunday. A quiet week. 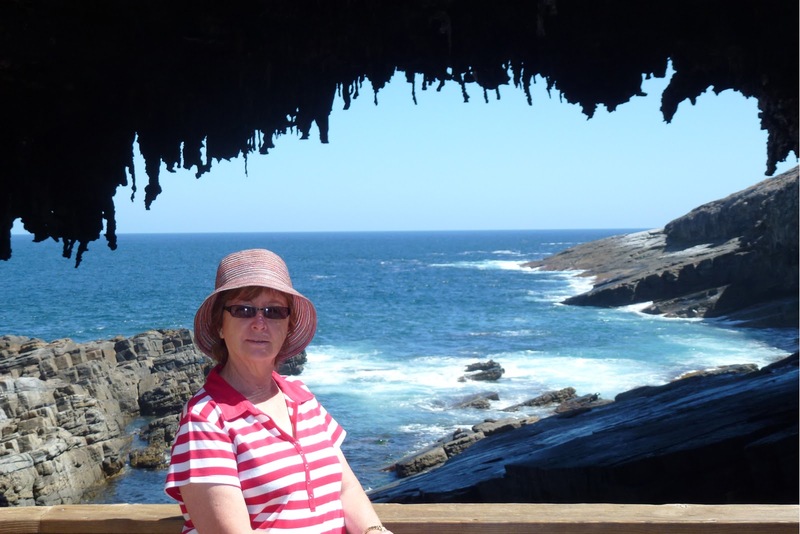 one picture to share... me on Kangaroo Island. Who would believe that was a year ago.